Before some months ago we all listen about about Jio Prime membership Rs.99 plan & Jio Summer Surprise Offer Rs.303 plan to get Unlimited Data & Voice Calling free till July 2017. But after TRAI order Jio has to closed their Summer Surprise Offer. But Jio has a big basket of offers. Yes Jio also announced Jio Dhan Dhana Dhan Offer. Its a loot offer by Jio. This July and Jio Dhan Dhana Dhan Offer are goining to end soon. Buy Don’t worry. Jio are comeing back with new plan. Inthis new plan Jio repeat Jio Dhan Dhana Dhan Offer again. In Jio Summer Surprise Offer every Jio customer who made recharge for Rs.99 + Rs.303 before ending Summer Surprise Offer get 1GB data + unlimited local + std calling free for next 3 month + 1 month. 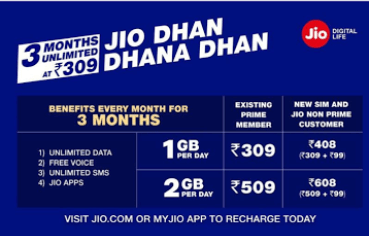 In Jio Dhan Dhana Dhan Offer Users must have to make Jio Prime Recharge worth of Rs.99 + Rs.309 or Rs.99 + Rs.509 to get 1GB data per day + unlimited local + std calling per month for next 3 months, 2GB data per day + unlimited local + std calling per month till next 3 months respectively. While Jio new Rs.349 plan will give 1GB 4G data + Unlimited calling for next 84 Days after ending of Jio Dhah Dhana Dhan Offer. Jio also offering Rs.349 Plan in which users will get 20FB 4G data for 56 days and it won’t offer daily data. As it is very very good news for ll those Jio users who was unable to recharge for Rs.303 to get benefit of Jio Summer Surprise Offer can get same benefit till 15th April with Jio Dhan Dhana Dhan Offer. Yes just make your Jio recharge with Rs.99 + Rs.309 or Rs.99 + Rs.509. And get 1GB/2GB data per day + unlimited Local+STD calls free for next 3 months. Remember only Jio non prime members will recharge with Rs.99+Rs.309/509 while Jio prime members will make recharge of Rs.309/Rs.509 only. Now again make Jio Recharge for Rs.399 and get Unlimited calling + 1GB 4G data per day for next 84 days. As Reliance Jio Rs.309 or Rs.509 recharge pack’s validity was 28 days. but running of Jio Dhan Dhana Dhan Offer users had not to make any recharge within next 84 days. after making Jio Rs.99 + Rs.309/Rs.509 recharge on or before 15th April 2017. Now Users again get 84 days more validity on Jio Rs.399 plan. This Plan is same as Jio Dhan Dhana Dhan, only validity and recharge amount is changed. Jio Rs.309 Recharge Plan :- The Jio users who are Jio prime member will recharge of Rs.309 only & those users who not become a JIo prime member will first recharge with Rs.99 then make recharge of Rs.309. In Jio Rs.309 recharge Jio users will get 1GB 4G data per day + Unlimited Local & STD calls free per day, per month for next 84 days. Jio Rs.509 Recharge Plan :- As we talked in above steps Jio prime users make recharge with Rs.509 & no prime Rs.99 + Rs.509. In Rs.509 recharge validity will same as Rs.309 recharge while data limited per day will increase. In Rs.509 recharge users will get 2GB 4G data per day + Unlimited Local + STD calls per day, per month for next 84 days. New Jio Rs.399 Recharge Plan :-The Jio users who are Jio prime member will recharge of Rs.399 only. In Jio Rs.399 recharge Jio users will get 1GB 4G data per day + Unlimited Local & STD calls free per day, per month for next 84 days. New Jio RS.349 Recharge Plan :- The Jio users who are Jio prime member will recharge of Rs.349 only. In Jio Rs.349 recharge Jio users will get 20GB 4G data for 56 Days only and it won’t offer daily data. Steps :- There are many online recharge platform to make Jio recharge. You can select any one to make recharge. 5. Enjoy unlimited data + calling for next 84 days. Important :- Get Unlimited 4G data 1GB Per Day + Unlimited CXalling for 84 Days at Rs.399 Recharge. Note :- Thgis information we got from our source this plan may be change or not. Be sure before make any Jio Recharge.